We have a new top pick! We have just named the Extreme Dog Fence our #1 choice in dog fences. We know what you may be thinking, is this a truly wireless system? Well not really. 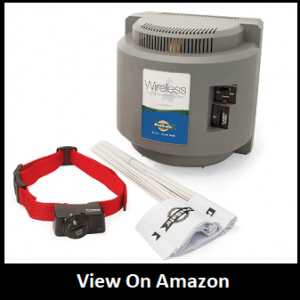 Although the dog’s collar connects wirelessly, the Extreme Dog Fence® requires that a wire creates the boundary on your property. There are many reasons why this fence outperforms the rest. With standard “wireless” fences, you can generally only contain up to ¾ of an acre of land at the most. With the Extreme Dog Fence, you can contain up to 25 acres of land. The collar that comes with the Extreme Dog Fence® won’t weigh your doggie down. Weighing in at only 1.1 ounces, the Extreme collar can be used for dogs as small as 8 pounds, and up. Fully adjustable and waterproof, the Extreme collar features contact points that are covered in rubber, which make it more comfortable for your dog. Whether you have 1 dog or 5, the Extreme Dog Fence® can accommodate you. It allows an unlimited number of dogs on the system. Simply choose how many collars you need to receive with your kit. The kit comes standard with 500 feet of wire, which is enough to contain 1/3 of an acre. Do you have more land than that? Simply add the amount of wire you need, in increments of 500 feet. For example, if you have one acre of land, you would need about 1000 feet of wire. The Extreme Dog Fence® offers a beep only mode that is used for training. Levels 1-5 are consistent levels of correction, going from a low level at a 1 to the highest level of 5. Levels 6 and 7 are progressive. This means that the correction starts out low and ramps up according to how quickly the dog is running towards the wire. On the transmitter, you are able to set how close to the wire that your dog travels, before he hears the beep and receives the correction. This is great because some dogs need a warning further before the wire than others, to deter them from crossing the boundary you have created. Our dog is our life and we try to secure them and protect them from every dangerous thing. The best wireless dog fence systems play an important rule in it and these dog fences decrease our work for the dog’s security. They provide us with all of these features which we required to protect our dog. In the list of our top wireless dog fences, we add Extreme dog fence which is the second generation. 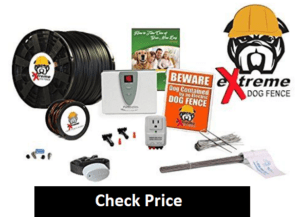 Recently, we see a lot of requests on this smart dog fence and those people who use the extreme dog fence give us a good and positive review about the fence. It shows the quality and next level work of the company and team. This dog fence has no cons so far because people use it and they don’t have any complaint about it. Well, Long story short, the Extreme Dog Fence Second Generation is the best pick for you in 2019 and when you buy and use it you realize how good is that. So, don’t waste more time on other things just grab this special for your dog.